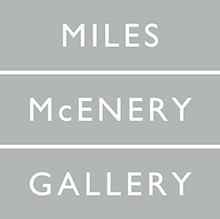 NEW YORK – MILES MCENERY GALLERY is pleased to present an exhibition of new paintings by Jason Middlebrook for his inaugural solo show with the gallery. A public reception will be held for the artist on 14 March from 6:00 to 8:00 p.m. at 520 West 21st Street, and the exhibition will be on view 14 March through 13 April. It is accompanied by a fully illustrated publication, featuring an essay by Mary-Kay Lombino. Jason Middlebrook’s bold and glossy, yet surprisingly nuanced sculptures are a representation of man’s relationship with nature. Trees transformed into wooden planks with sliced cross-sections depict painted patterns comprised of geometric abstractions. Using three-dimensional constructions, Middlebrook challenges viewers to think below the surface and invites them to reflect on nature as a work of art—calling attention to, how above any human activity, the natural world continues to prevail. The three-dimensional works leaning against the walls of Miles McEnery Gallery embrace elements of both botany and geometry. Influenced by an aversion to wastefulness and a fond admiration for the natural world, Middlebrook’s pieces respect and acknowledge nature while simultaneously celebrating form through the artist’s brushwork. To create his intriguing planks, Middlebrook first meticulously studies the shape of the wood and lets it guide his next steps. Using the smooth side of the surface, Middlebrook paints the wood while taping off the margins of the patterns that in some cases completely cover the surface, and in others operate more as a net or a screen. 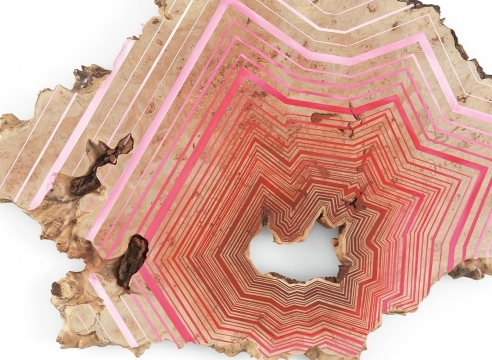 This process allows the imperfect qualities of the wood to show through from the background, reminding viewers of the fundamental properties of the material itself. Through this process Middlebrook creates a juxtaposition between the artificial geometric patterns of the painting and the natural patterns of the grain. Additionally, the colors of the paint are purposely bright and striking to highlight the tension between man and nature. Using these techniques, Middlebrook draws attention to the tree and its form, making a statement with a delicate hand. 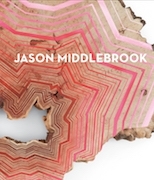 JASON MIDDLEBROOK (b. 1966 in Jackson, MI) received his Bachelor of Fine Arts degree in 1990 from the University of California at Santa Cruz, and his Master of Fine Arts degree in 1994 from the San Francisco Art Institute. He also participated in the Independent Study Program at the Whitney Museum of American Art, New York, NY in 1994-1995, and completed an Iaspis Residency in Stockholm, Sweden in 2009-2010. Recent solo exhibitions include Jeff Bailey Gallery, Hudson, NY; “My Grain,” Galleria Pack, Milan, Italy; “Drawing Time,” David B. Smith Gallery, Denver, CO; “The Small Spaces in Between,” Gallery 16, San Francisco, CA; “Your General Store,” New Mexico State University, Las Cruces, NM; “Gold Rush,” Peters Projects, Santa Fe, NM; “Jason Middlebrook: Mosaic Tree Stumps,” Jeff Bailey Gallery, Hudson, NY; Morgan Lehman Gallery, New York, NY; “There is a map in every tree,” Monique Meloche, Chicago, IL; “Line over Matter,” Lora Reynolds Gallery, Austin, TX; “Submerged,” SCAD Museum of Art, Savannah, GA; “The Line That Divides Us,” Lora Reynolds Gallery, Austin, TX; “My Landscape,” Massachusetts Museum of Contemporary Art, North Adams, MA; and “Underlife,” Albright-Knox Gallery, Buffalo, NY. Recent group exhibitions include “Arboreal,” Moss Art Center, Virginia Tech, Blacksburg, VA; “New Acquisitions / Nuevas Adquisiciones: UAG Permanent Collection 2015-2017,” University Art Gallery, New Mexico State University, Las Cruces, NM; “Wood as Muse,” The Art Complex Museum, Duxbury, MA, curated by Donna Dodson and Andy Moerlein; “Maker, Maker,” Children’s Museum of the Arts, New York, NY, curated by Paul Laster and Renée Riccardo; “Taconic North,” LABspace, Hillsdale, NY, curated by Susan Jennings and Julie Torres; “Cortesie per gli ospiti,” Galleria Pack, Milan, Italy; “Casa Futura Pietra,” Parco Archeologico di Siponto, Siponto, Italy; “Painting @ The Very Edge of Art,” Contemporary Art Galleries, University of Connecticut, Storrs, CT; “The Big Show 9,” Peters Projects, Santa Fe, NM; “Painting is Dead? !, Figure One, University of Illinois, Champaign, IL; “Misappropriations: New Acquisitions,” Orange County Museum of Art, Newport Beach, CA; “Geometries of Difference: New Approaches to Ornament and Abstraction,” Dorsky Museum of Art, State University of New York, New Paltz, NY; “Into The Woods, ” Morris-Warren Gallery, New York, N Y; “NO W-ISM: Abstraction Today, ” Pizzuti Collection, Columbus, OH; “My Landscape, abstracted,” Museum of Fine Arts, Boston, MA; “SITElines,” SITE Santa Fe, Santa Fe, NM; “Jason Middlebrook / Letha Wilson, ” Retrospective, Hudson, N Y; “Painting: A Love Story, ” Contemporary Arts Museum Houston, Houston, TX; “Second Nature, ” Albany International Airport , Albany, N Y; “ Visual Arts Faculty Exhibition, ” Benning ton College, Benning ton, V T; “Expanding the Field of Painting,” Institute of Contemporary Art, Boston, MA; and “Pattern: Follow the Rules,” Broad Art Museum, Michigan State University, East Lansing, MI, which traveled to Museum of Contemporary Art, Denver, CO.
His work is included in the permanent collections of Addison Gallery of American Art, Andover, MA; Albright-Knox Art Gallery, Buffalo, NY; Altoids Collection, New York, NY; Arthouse, Austin, TX; British Airways Art Collection, Waterside, United Kingdom; Denver Art Museum, Denver, CO; Harn Museum, University of Florida, Gainesville, FL; Marte Museum, San Salvador, El Salvador; Microsoft Corporate Art Collection, Redmond, WA; Museum of Contemporary Art, Chicago, IL; Museum of Modern Art, NewYork, N Y; NASA Art Program, Washington, D.C. ; New Museum, New York, N Y; Pacific Bell, San Francisco, CA; Progressive Art Collection, May eld, OH; and Whitney Museum of American Art, New York, NY. Jason Middlebrook lives and works in Hudson, NY.